Network security is very important for small business owners. With so much riding on your network security, you can’t afford to have any deficiencies. There are several network security solutions that mitigate risk and protect your data. One solution is having the right IT partner to help with these security solutions. 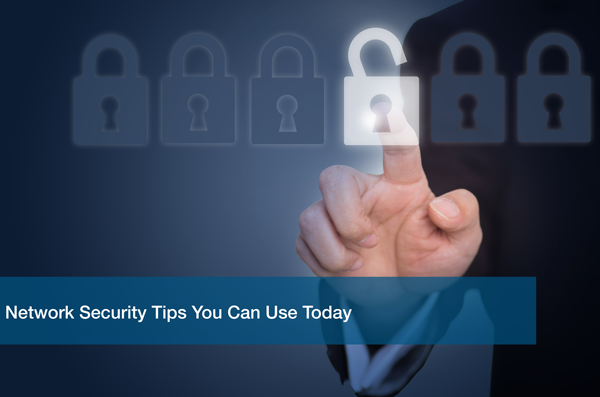 It can be overwhelming to think about network security, but here are a few simple things you can do today! The firewall serves as a “front door” to your network, it keeps unwanted visitors out! Make sure your firewall is current and that updates are being applied. You can also test your firewall. There are many free tools out there to help test your firewall. How physically secure is your server? This might be overlooked in small businesses, but it is still very important. What if an employee trips over a cord and the server crashes to the floor? I’ve even heard stories that a cleaning crew unplugged a server to plug in a vacuum cleaner! Best thing to do is to lock up the server so that these types of accidents don’t happen. If you don’t have a room that you can devote to the server, try a server security enclosure. There are several server security enclosure options that will work for what you need. This sounds a little silly, but you want to make sure that you are not opening any strange emails. These spam and phishing emails can cause a lot of harm to your network security. Do not open any attachments or links in the email and delete the email right away. Bad spelling and poor grammar are red flags! If you receive an email requesting money, do not respond. Responding confirms that the email account is active and leads to more of these emails. Still feel overwhelmed about your network security? Call ITC to schedule your FREE IT Analysis today! Have ITC look at your network security, infrastructure, managed support & services, and telecommunications.